Have you ever wondered what circus artist's eat when they are off stage? Have you ever wanted to have a back stage tour into the personal lives and experiences of the acrobats? The International Circus Cookbook answers the questions by bringing you on a culinary world tour, featuring some of the worlds top aerialists, acrobats, jugglers and contortionists. 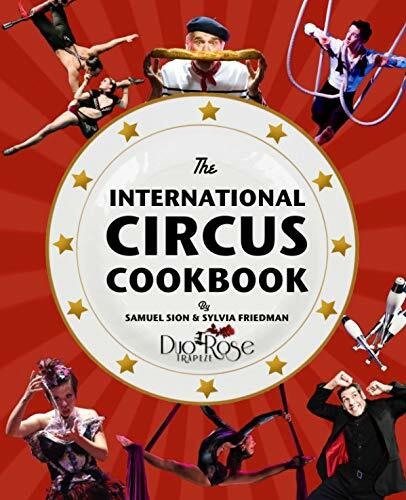 The International Circus Cookbook follows the experiences of Samuel and Sylvia over ten years while working as professional duo trapeze artists. It features the stories and personal anecdotes of over 45 international performers along with their favorite recipes. This book showcases the incredibly talented performers with whom we have had the joy of sharing the stage and the kitchen. These recipes were contributed by the artists we met during our travels, and we have added some of our own favorites as well. From easy after-show fare to fancy cocktails for your nights off, this book gives you a glimpse into the lives and kitchens of artists from a variety cultures. Coming from diverse backgrounds, each artist brings their unique heritage to the table. We have collected some of their recipes along with their history to share with you, the reader. It is important to us to share the stories behind each artist and how they have impacted our lives. The circus is a “family” and we share our talents and our tables when we have the opportunity to meet. We now share with you, our audience, the flavors from our “family” throughout the world. We would like to share our passion for cooking and circus arts with you and we hope you have a unique culinary experience.